This week a trailer arrived for Percy Jackson: Sea of Monsters, the sequel to Percy Jackson & the Lightning Thief which was undoubtedly hoped by Hollywood bosses to be the natural successor to the huge gap in the market that Harry Potter would be leaving once his franchise came to a close in 2011. Therefore, it should come as no surprise that Percy Jackson & the Lightning Thief bears many similarities with Harry Potter and the Philosopher’s Stone. – based on a series of fantasy novels. These are just a few of the most obvious similarities between the two franchises but is Percy Jackson an apt replacement for Harry Potter? In a not very successful attempt to distance itself from Harry Potter comparisons the protagonist is made older than his twelve year old novel counterpart in Percy Jackson & the Lightning Thief and the producers went for one of the most promising young actors around: Logan Lerman. Lerman had already appeared in 3:10 to Yuma, The Number 23 and Gamer among others before landing the title role in the franchise which is obviously very different to Harry Potter‘s three unknown actors in main roles. You can’t deny just how special the Harry Potter franchise is: it has spawned fans all over the world, touching billions of people with its themes of friendship, family and good vs evil. There are so many things now associated with the wizarding world of Harry Potter and, in my opinion, there is not going to be another franchise like it in our lifetime. So does Percy Jackson even come close to that? The short answer is… no. But it’s a damn good attempt! Lightning Thief is a fast paced introduction to this incredible world where Greek mythology still has a huge part to play in the existence of our world. Percy Jackson is a very likeable character played brilliantly by Lerman and supported by a cast including Pierce Brosnan, Sean Bean, Uma Thurman, Rosario Dawson, Steve Coogan and Kevin McKidd. The story, although a little weak at times, takes the audience on a great journey and it becomes a film that is really well tied together. Some of the twists lack a punch and there is a bit of a lack of dramatic tension but the final product is a very enjoyable watch. The action sequences are really well choreographed, seeing Percy Jackson master his powers throughout the film instills a sense of fulfillment as well. The Percy Jackson franchise is not going to span as long as Harry Potter nor gain as much success, but it provides something to fill the hole that the end of a franchise leaves inside all of its fans. There is a lot of fun to be had with Lightning Thief and I, for one, am looking forward to Sea of Monsters. Bale as a fictional hero on the big screen. Christian Bale’s acting talents have brought him praise after praise for a number of films including The Fighter, The Prestige and 3:10 to Yuma but in terms of his public image Bale is sometimes dealt a raw deal. In fact, you never really hear much about Bale off screen but one infamous news story took place back in 2008 whilst Bale was filming the largely unsuccessful Terminator Salvation. You may remember that a video was released onto the internet of Bale having an incredible rant at the director of photography after he walked into Bale’s line of sight during a take. This incident was reported all over the world on main news channels and made Christian Bale look like a petulant little brat. When he later apologised for his actions this was kept away from most of the news. Therefore, it is common when people think of Christian Bale nowadays to associate him with this incident and strike him down almost instantly as not a nice person. However, I aim to change that with these news stories that didn’t quite do the rounds as much as the ‘rant’ but should have and should be brought to the forefront of people’s minds to show just what a fantastic character and heart warming person Christian Bale is. Christian Bale is known for taking his acting very very seriously and has shown it time and again by slimming down radically, to the point of looking really ill, to pull off roles accurately (The Fighter, The Machinist). But Bale seems to have taken the role of Batman to heart and is carrying out all his duties to make people see what a real hero he is. Earlier this year upon the release of The Dark Knight Rises there was a tragic shooting in Aurora, Colorado. 12 people were killed with a further 58 reportedly injured. These victims were just waiting to see a midnight screening of the third and final chapter in Christopher Nolan’s Batman trilogy. 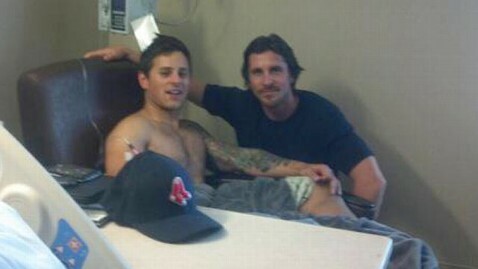 Just a few days later Christian Bale was in Aurora visiting the survivors of the attack. Bale spent a few hours at the hospital where he spoke to victims, doctors and police officers who were among the first to respond to the shooting. These people wanted to see Batman and Christian Bale made sure that they did. Bale meets Aurora shooting victim. And now Bale has been at it again, making a young child’s wish come true. Five year old boy Jayden Barber was diagnosed with terminal bone cancer back in 2010 and it was his dream to meet Batman. A Facebook campaign was started by Jayden’s family to try and get Christian Bale to visit his young fan and sure enough, Bale was more than happy to oblige. 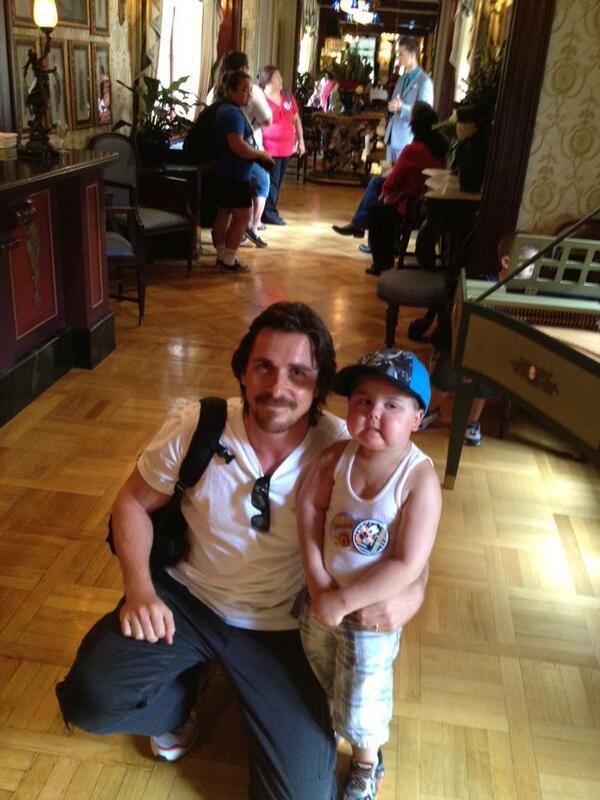 Christian Bale flew Jayden and his family out to Los Angeles to meet him and he had dinner with the family too. This isn’t something that Bale needed to do but he obviously takes his job seriously and playing Batman he will have become something of a real life hero and a role model and this is a wonderful thing of him to do: making a young boy’s wish come true. And there was more good news for Jayden and his family as they recently found out that the cancer was in remission. Christian Bale makes a young boy’s wish come true. Christian Bale isn’t the only big screen hero to have done this recently though as Ron Perlman, famous for playing Hellboy has done the same recently this year. Perlman donned full make-up and costume to visit leukaemia sufferer, six year old Zachary . When asked for what he wished for most Zachary said that he wanted to meet Hellboy and don the make-up himself. Sure enough, Perlman and Spectral Motion made this boy’s wish come true. 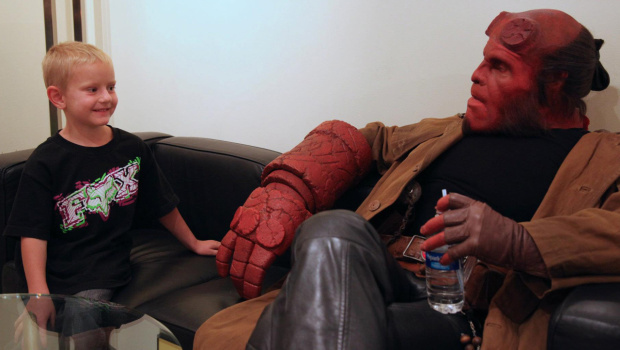 Ron Perlman becomes Hellyboy to make a young boy’s wish become reality. 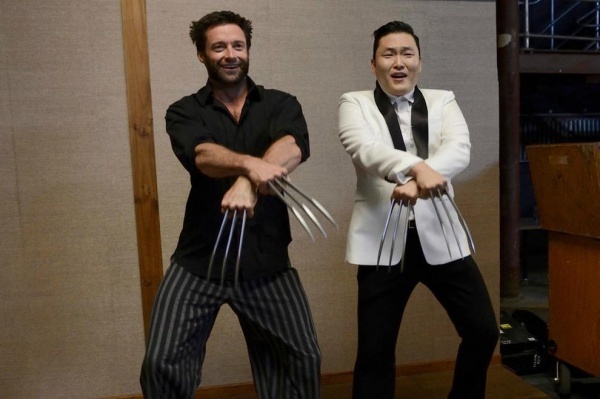 News of the Week (8/8/2012) – Great News for Marvel Fans & Plenty of Casting Excitement. 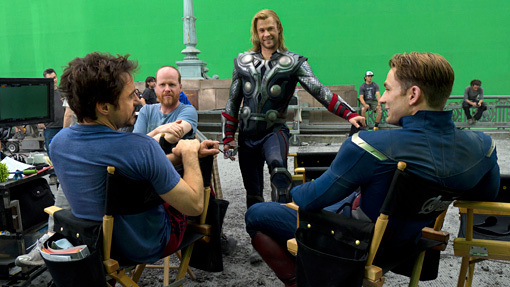 The biggest news of the week broke last night with the announcement from Marvel that they have agreed a deal with Joss Whedon to return to write and direct the sequel to one of the biggest movies of all time, The Avengers. This is a no brainer and fans have been waiting for this announcement for a long time after the success of the biggest blockbuster of the summer. Marvel are also bringing out another team movie (we think separate from the Avengers universe but who knows really?) in Guardians of the Galaxy and a new writer has been snapped up to pen the script. Chris McCoy has never had a film produced yet his scripts have ended up on the Black List in 2007, 2009 and 2011. For those that don’t know the Black List is where the best unmade scripts end up basically so his writing must be pretty good! Apparently all of his scripts have a quirky comedic element to them so his writing for Guardians of the Galaxy is something to look forward to. Along with Marvel’s Avengers, The Hunger Games was another huge film this summer and casting has taken another step forward on its sequel Catching Fire and it is no wonder being as though the sequel is slated for a November 2013 release. Meta Golding is the newest cast member to join who will be playing Enobaria, a former Hunger Games winner from District 2 who became champion through brutal methods. Meanwhile Patrick St. Esprit will take the role of Romulus Thread, the head peace keeper of District 12. Jennifer Lawrence, as Katniss Everdeen, was the star of The Hunger Games and the producers are desperate to keep her in the role as she has reportedly been offered a huge $10million to return to the role. Jennifer Lawrence has also signed up for a new film entitled ‘The Ends of the Earth‘, a period drama that is already being seen as a chance for Lawrence to win the Oscar she so narrowly missed out on just a couple of years ago. The story follows 54 year old oil tycoon Ernest Marland who marries his adopted daughter Lydie (Lawrence) after having the adoption anulled. Weird right? Anyway, Lydie helped her husband incorporate social issues of the day into his work and became quite the socialite in the process. The main conflict of the film arises when Ernest’s business comes crashing down. 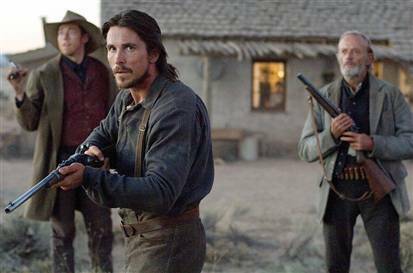 Christian Bale, fresh from the huge Dark Knight franchise and Chinese war epic Flowers of War has signed on to dip his feet back in the pool of the Old West as he joins Todd Field’s upcoming Western Creed of Violence. Back in 2007 Bale appeared in 3:10 to Yuma and I loved it so I am very excited to see him return to the genre. In 3:10 to Yuma Bale played the War veteran good guy, here he is a small-time assassin named Rawbone, who reluctantly teams with a Bureau of Investigations agent to infiltrate the Mexican criminal underworld during the Mexican Revolution in 1910. Pretty different I think you would agree? 3:10 to Yuma (2007) Review. The western is the original genre of cinema. The first ever narrative film was The Great Train Robbery and was the western which began Hollywood’s long running obsession with cowboys and outlaws. However, with the uprising of science fiction and the superhero genre now becoming the leading money spinners in cinema modern westerns don’t usually do that well in the mainstream. 3:10 to Yuma, released in 2007, managed to make a small profit but didn’t pull up many trees, yet I think that this is a fantastic film that proves the western can still entertain. 3:10 to Yuma is the story of Dan Evans (Christian Bale), a war veteran who lost his leg and now struggles to keep his family on his ranch through drought and debt problems. When the infamous outlaw Ben Wade (Russell Crowe) finally gets captured and needs escorting to the 3:10 train to Yuma prison, Dan volunteers to take him for a price. Along the way Dan wins the respect of his son and finds a mutual respect and reluctant friendship with Ben Wade. Directed by James Mangold, not a very famous director by any means, 3:10 to Yuma manages to capture the essence of the western very well; the visual direction of the film is very good. When people think of westerns they usually think of gunfight after gunfight but what you have here is a slow paced film but with a story and characters like these there is no danger of it ever becoming boring. Both Christian Bale and Russell Crowe put in fantastic performances and the character of Ben Wade is possibly one of the greatest antagonists I have ever seen; I think that his personality is a great one and rather than just being a badder than bad villain it becomes clear that he actually does have morals and he does have his own rules that he lives by, despite the fact that he runs one of the roughest gangs in the west. The conflict that arises between Evans and Wade is very interesting and watching the respect that these two men have for one another grow throughout their film and they confess secrets to one another is actually quite touching. The supporting cast of Peter Fonda, Alan Tudyk and Gretchen Mol all do a good job with what they are given but Ben Foster who plays Ben Wade’s right hand man Charlie Prince is absolutely fantastic and brings a real sinister side to his character. Rising star Logan Lerman puts in a shift as Evans’ son and fan of Ben Wade and it is clear to see that he has real potential as an actor. Throughout 3:10 to Yuma there isn’t that much action with the real emphasis based on the interactions between Dan Evans and Ben Wade as I mentioned earlier but when there is action it is very good. There is a scene at the mines where Evans’ group rescue Ben Wade from torture that goes down very well and the final shootout is brilliant. People are dropping like flies during the final gunfight when Evans races to get Wade onto the train and the ending is pretty much as perfect as it could be. 3:10 to Yuma is by no means the best film ever but since the first time I saw the western it has been on my list of favourite films. The Story: Django Unchained is set in the deep south of America and follows Django, a freed slave who travels across America with dentist turned bounty hunter Dr. King Schultz. Together, they try to retrieve Django’s wife from the charming but sadistic plantation owner Calvin Candie and his band of ruthless slavers. It sounds like a good old revenge story, something which Quentin Tarantino has done excellently before with the wonderful Inglorious Basterds and possibly my favourite Tarantino film: Kill Bill. The Genre: This is Tarantino’s first Western. Having dipped his toe in the action, crime, war and thriller genres he now turns his hand to this. The western is the oldest genre of film and cinema owes its heritage to the genre. However, recent westerns such as Appaloosa, The Assassination of Jesse James and 3:10 to Yuma haven’t been critical successes (despite the last two being brilliant films) and maybe the audience has grown tired with the genre as it offers nothing new really. Recently, sci-fi has taken over as the dominant genre of film in cinema but Tarantino obviously just sees that as a challenge. The Cast: Regular Tarantino collaborator Samuel L. Jackson is on board (no surprises there) but in the main role is Jamie Foxx. Foxx seems to split opinion between film fans and it is obvious why, his back catalogue of films leaves a lot to be desired but he does have one Oscar win and another nomination to his name, proving that he does have the talent and Tarantino could easily get the best out of him. Playing the villain of the piece is the phenomenal Leonardo DiCaprio. DiCaprio started out as a young heartthrob but has developed into a fine actor and seems to get better and better with every film he makes; working with such a highly rated director could give DiCaprio the chance to win the Oscar he longs for. Playing the German bounty hunter is Christoph Waltz who, of course, won an Oscar for Tarantino’s Inglorious Basterds where he put in a great performance and I think the same can be expected here. The supporting cast includes James Remar, Kerry Washington and James Russo, all well established actors themselves. The Director: Everybody knows Quentin Tarantino and everybody on the planet should have seen at least one of his films during their lifetime. Ever since Tarantino made his directorial debut he has churned out success after success with Reservoir Dogs, Pulp Fiction, Kill Bill and Inglorious Basterds. He is yet to falter in the world of film making and so that pretty much nails success to Django Unchained. Everything that he touches turns to gold and, as a big fan of the Western genre, I hope he has the same effect here. His very unique style and love for action, dialogue and story make his films a delight to watch and Django Unchained should be fantastic! Django Unchained comes out in less than a year, spot on for Oscar contenders and you have to imagine that this would be a tactical move by Tarantino and the studio. In the build up to its release we can hope for a lot of trailers and more pictures to be revealed soon which will almost certainly raise the hype for Django Unchained.